Warner Bros. has announced that they will begin selling their films as apps through the iTunes App Store as a workaround for people who live in countries without an iTunes movie store. The concept is quite interesting and the actual apps work like DVDs for your TV. There are extras, scene selection, trivia, and other features all packed into the apps. The app itself is free of charge and uses the in-app-purchase feature to let you either download or stream the film to your device. You even get a five minute preview of the film before you have to purchase. The applications work universally with unique interfaces for the iPhone/iPod touch and iPad. The movie prices are the same as on the iTunes movie store and currently only Inception and The Dark Night are currently the only films available. Streaming or downloading the films are $11.99 and $9.99 respectively, which are the same prices as on the iTunes movie store. 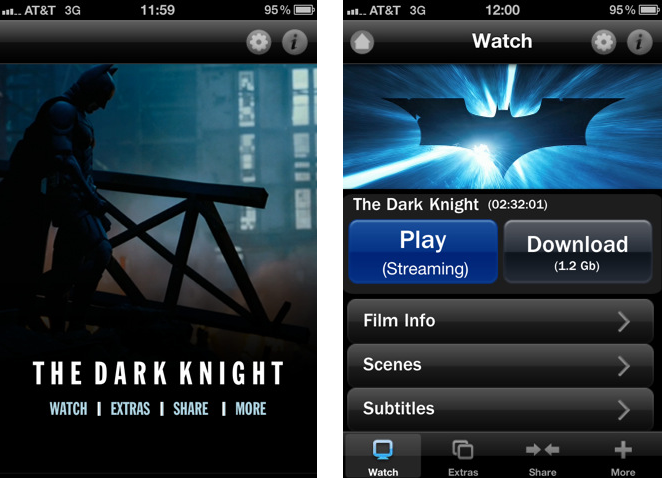 The movie streaming works on both WiFi and 3G, which should be great for iPad 3G users. The applications also provide a lot of content that you can’t get through a normal iTunes movie download, like film extras and 3G streaming. If you download the apps let us know how it works out for you, in the comments.